Work positioners like the Manual Mobile Lift & Tilt Tables (MMLTT) from BHS reduce the risks of muscle sprains, strains, and tears. Many workers in warehouses and manufacturing facilities must sort, unpack, or otherwise handling small parts held in tote boxes; as the contents of the box diminish, staff must bend and reach further and further to continue work. The Occupational Health and Safety Administration points out that repetitive, awkward movements such as these increase the risk of developing a musculoskeletal disorder — and associated rises in workers’ compensation insurance.Manual Mobile Lift & Tilt Tables virtually eliminate the risk by tilting bulk containers toward the worker, bringing components close to their bodies to prevent unsafe motions. Ergonomists that study manufacturing applications, including automotive, recommend Tilt Tables for assembly and welding, as well. 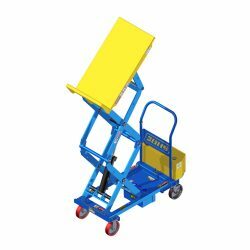 These hydraulic-powered positioners bring heavy components within easy reach so employees do not have to resort to uncomfortable postures. To learn more about how Manual Mobile Lift & Tilt Tables can improve safety at your operation, call BHS at +1 314 423 2075 .